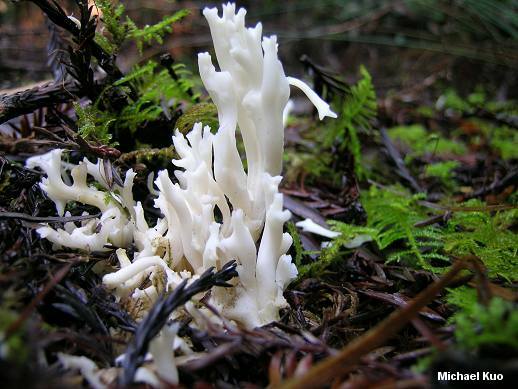 Defining features for this widely distributed coral mushroom include: terrestrial habitat; white surfaces that sometimes become pinkish in age; elaborate branching; bluntly pointed tips that do not become toothed in appearance; and microscopic features (see below). 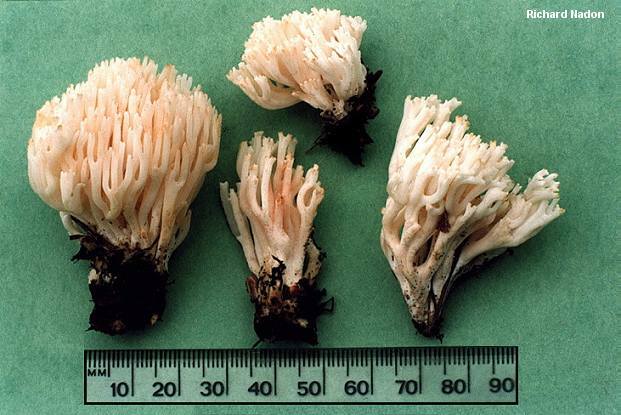 Unlike superficially similar species of Ramaria, Ramariopsis kunzei has a white spore print and surfaces that do not turn green with iron salts. 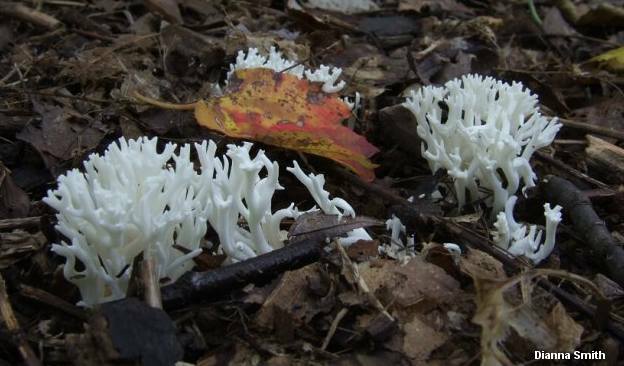 Ecology: Probably saprobic; growing terrestrially or rarely from well decayed wood; scattered or gregarious; in woods; summer and fall (or winter in warm climates); widely distributed in North America but apparently rare in the Rocky Mountains. My collections have been made under mixed conifers and hardwoods in northern Michigan and under redwood in California. 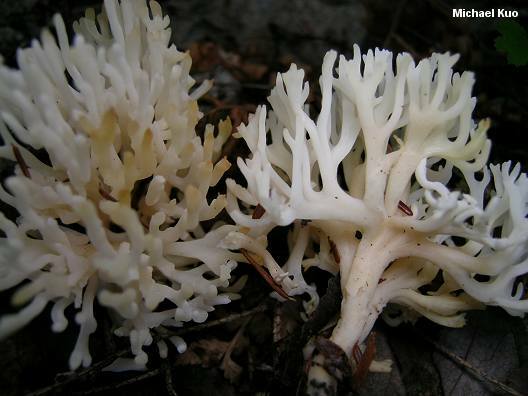 Fruiting Body: 2-12 cm high; up to 10 cm wide; repeatedly branched. Branches: 1-5 mm thick; smooth; white, often developing dirty pinkish hues with age; tips bluntly pointed, colored like the sides. Base: When present .5-3 cm long; to about 1 cm wide; whitish, sometimes becoming pinkish or yellowish; finely fuzzy. Flesh: Whitish; brittle and fragile--or in some collections fairly pliable. Chemical Reactions: Iron salts negative on branch surfaces. Microscopic Features: Spores 3-5 x 3-4.5 µ; globose, subglobose, or broadly elliptical; minutely spiny; with a fairly prominent apiculus. Basidia 4-sterigmate; up to about 40 µ long. Clamp connections present and easily demonstrated. REFERENCES: (Fries, 1821) Corner, 1950. (Saccardo, 1888; Coker, 1923; Corner, 1950; Petersen, 1969; Smith, Smith & Weber, 1981; Weber & Smith, 1985; Arora, 1986; Phillips, 1991/2005; Lincoff, 1992; Barron, 1999; McNeil, 2006; Miller & Miller, 2006.) Herb. Kuo 09130404, 01140501.